William Galen Doss was one of the earliest artists that settled in Laguna Beach having arrived there in 1922. As a founding member, he became known as the “Dean of the Laguna Beach Artist Colony”. Born in Illinois both of his parents died when he was nine years old. After having lived in Michigan he made the move to California after corresponding with young cousins. The glowing accounts of the state compelled him to relocate. He arrived in Los Angeles in 1904. A newspaper interview with Doss recalled his love for art even as a child. He couldn’t recall a time when he wasn’t without a bunch of brushes and paint in his hands. His first oil painting at the age of ten was of his favorite horse. The artist’s obituary has recollections, from early colony members, of Doss and his many walks with colleague, Frank Cuprien. The two often argued about art in loud and sometimes angry tone, but always remained good friends. Another good friend and artist, Roy Ropp studied with Doss and credited him for teaching him to paint. They both were associated with the Laguna Beach Country Club. Doss himself was essentially self taught. He stated that although he had some advice along the way he mainly, “Learned how to paint instead of being taught”. Doss made annual trips to Portland, Oregon to visit his stepson, Alba Scherer, who lived on Garden Home Rd. They would go out on painting expeditions, and one painting titled: Mt Hood is inscribed: “We picked out a location the day before, drove here before sunrise, got set and painted as the sun hit the mountain, A. Scherer”. For years, Doss also painted in Pasadena and was well known there. 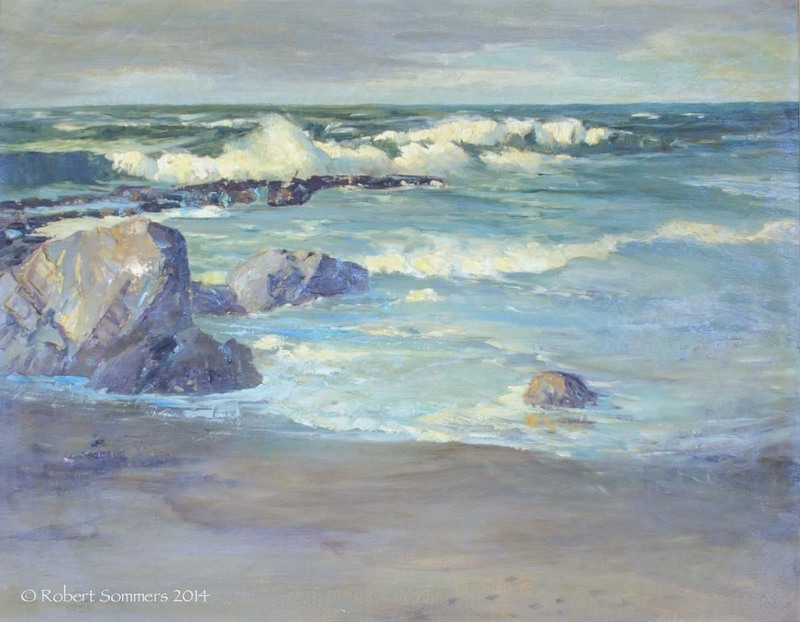 Known for his seascapes, one was prominently displayed on the wall behind the President’s desk at the Bank of America in Laguna Beach in the 1950’s. The artist’s home and studio was at 337 Bluebird Canyon Dr. It was one of several cottages he had owned and built along Bluebird. 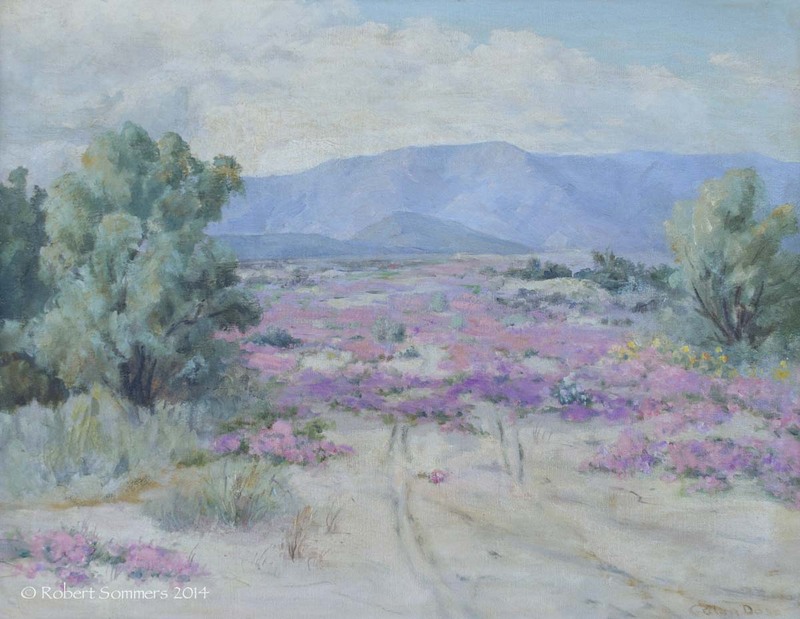 Doss had crossed paths or was associated with many prominent Laguna California artists Alice Fullerton, William Wendt, Julia Bracken Wendt, Frank Cuprien, William Griffith, Karl Yens, and Norman St Clair. From Askart.